Returning subscribers please login. 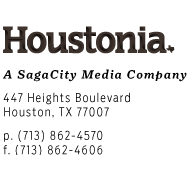 If you have not yet registered to use the Subscriber Services at Houstonia, please register for a free account below and get access to our wide range of subscription services and benefits. It's no secret: we throw the best parties in town! Become one of our VIPs and get advance notice and special offers for all of our great events. Would you like to be notified about special deals from our trusted partners? They run the gamut from travel to free gelato!